Information Security Policies Made Easy is the “gold standard” information security policy template library, with over 1500 pre-written information security policies covering over 200 security topics. Based on the 25 year consulting experience of Charles Cresson Wood, CISSP, CISA, it is the most widely used policy library in the world, with over 10,000 customers in 60 countries. 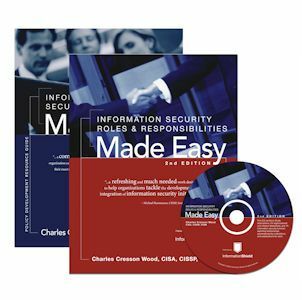 Take the work out of creating, writing, and implementing security policies.Information Security Roles and Responsibilities Made Easy by security expert Charles Cresson Wood, provides over 70 pre-written job descriptions, mission statements, and organization charts that you can easily customize for your own organization. Now click here to save $195 by purchasing together! $1,095.00 for both, $1,290.00 separately. Information Security Policies Made Easy and Information Security Roles and Responsibilities Made Easy are available for electronic download. Each product contains a print-ready PDF, MS-Word templates and an organization-wide license to republish the materials. (No physical CD or book). Information Security Policies Made Easy and Information Security Roles and Responsibilities Made Easy are also available separately.